I feel odd doing a very ME focussed page and have spent far too long fussing over it! I've always loved my name. I guess this became a big thing for me when I read Anne of Green Gables where Anne hated being called Ann and often wished to be called Cordelia. Mum and Dad liked the names Melissa and Melanie. Mum always enjoyed the Little House on the Prairie TV series, there were two actresses named Melissa (Melissa-Sue Anderson being one of them). Melissa means honeybee, and I like the thought that I can be industrious and produce something delicious like them! Caroline, my middle name means ladylike, and I love that! I'm named after Caroline Okely, who was the daughter of farmers in the North Beach area. She was called Carine for short and there's now a suburb named after her. I clipped the photo to the included mask for the fancy frame thanks for including that Peppermint!! PS I was featured as layout of the week over at LYM with this layout! What a beautiful page! 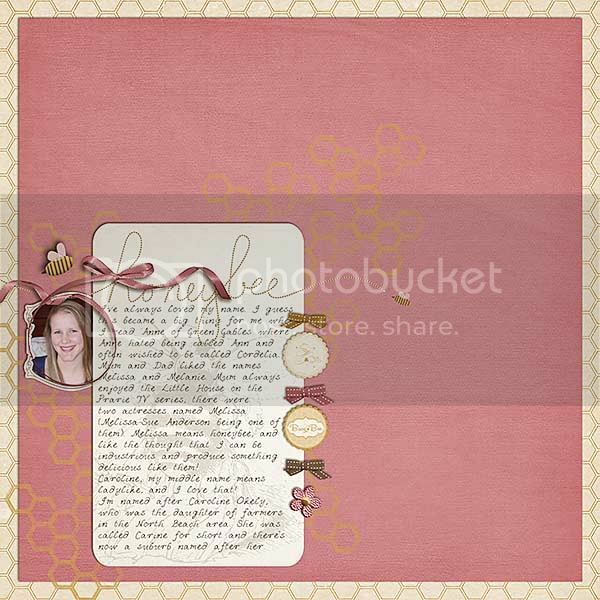 Love your journaling, and the colors and design are just wonderful! Thank you for playing with us at HMITM! What a great story about your name! Thanks for playing along over at HMTIM! Such a pretty page and awesome journaling!! Great design! Thanks so much for doing the HMITM challenge!! This turned out just beautiful , fantastic way you designed the page. Thanks for playing along with us on HMITM.